The Double Differential Transmission offers high-quality torque and HP conversion at a great value. The DDT makes both phase and length corrections, however, with a standard unit only random phase error corrections are automated. Automatic phase and length corrections, requires the DDT-MVC (Motorized Variator Control). Available in 1/2 and 2 HP models. The 4 HP model (DDT-4) has been discontinued. 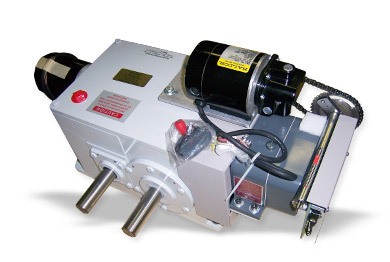 Applications requiring the DDT-4 are now recommended to use a servo motor. Combines both a Variable Speed Drive and a Phase Shifting Differential in one design so it can correct both random phase and constant length errors. Available as DDT-2 (2 HP), DDT-05 (1/2 HP). NOTE: DDT-4 is no longer available, please contact EMP for assistance. All DDTs include a motor for random phase error, but opting for the Motion Variable Control will automate the Length Error correction process as well. The ability to adjust anywhere within a range allows us to correct a length error. A Register System without this capability can not work effectively at today's high operating speeds. The selection of your DDT will depend greatly on the design of your machine, and the degree of automatic operation desired. Did you know? The DDT-MVC Transmission comes with both Phase and Length Motors. EMP recommends the use of the DDT-MVC option on the DDT Transmission when you want the length correction done automatically.